Ever wonder how celebrities look as if they are frozen in time? As if they don’t get old at all? Now a days, most celebrities are using laser, Botox, and many other cosmetic procedures that cost a chunk on our pay checks. On the other hand, there are a lot of anti-aging products, but they are packed with tons of chemicals and you’re not even sure if they are safe or would work for you. So if you don’t want to undergo cosmetic procedures and you simply want something that would work to give you a youthful glowing skin, follow this simple anti-aging serum recipe your skin will surely love! 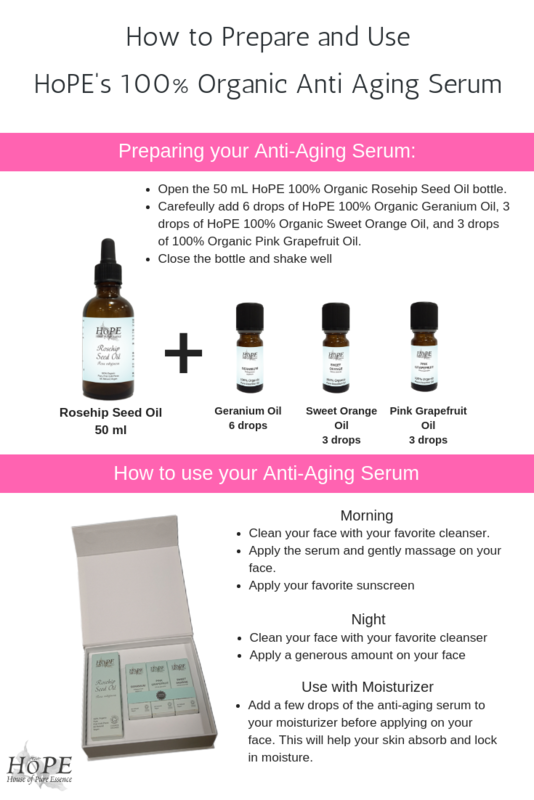 Why Make Your Own Anti-Aging Serum? You know exactly what the ingredients are and what you are applying to your face. You don't have to worry about harmful chemicals. You have the freedom to adjust the ratio of the oils. We’ve carefully selected the best essential oils and beauty oil for this anti-aging serum. These oils work together to reduce the appearance of fine lines and wrinkles, lighten dark spots, remove puffy-looking skin, and to even out your skin tone. 100% Organic Rosehip (Rosa rubiginosa) Seed Oil – contains vitamins C and E, essential fatty acids, and trans-retinoic acid that help minimize premature ageing and wrinkles and reduces scar tissue. 100% Organic Geranium (Pelargonium asperum) Oil – helps prevent wrinkles and fine lines by maintaining balanced female hormones. 100% Organic Sweet Orange (Citrus sinensis) Oil – improves the flow of blood to the skin and keeps it supple. Its antioxidant nature helps clarify skin and even out the skin tone. 100% Organic Pink Grapefruit (Citrus paradisi) Oil – reduces water retention to get rid of puffy skin. To make your anti-aging serum, you would need 50 ml Rosehip seed oil – that's 1 bottle of HoPE 100% Organic Rosehip Seed Oil. Then carefully add 6 drops of geranium oil, 3 drops pink grapefruit oil and 3 drops of sweet orange oil. Mix well. This ratio is based on the concentration of our oils, so we recommend using HoPE 100% Organic Pure Essential Oils and Beauty Oils for this recipe. And to make it easier for you, we all these oils together in our HoPE 100% Organic Anti-Aging Kit. If you want to use our mixture for an anti-aging serum, then apply it to your face and then add a layer of your favourite sunscreen. At night, then apply it generously to your face. You can also mix it with your favourite moisturisers. This will help your skin to absorb the moisturiser better. So as you can see, we have created the anti-aging serum to help you to look and feel great. If you are sick of trying every single anti-aging mixture out there then we are here to help, not to mention that we are always happy to give you the support you need when you are using the mixture as well. This isn’t just for the face either, it can be applied to the whole body! If you do plan on applying it to the whole body then please make sure that you dilute the mixture properly. If you are not sure how to do this then you can use our handy dilution guide to help. This will show you how to dilute oils, how to use them in relation to the body and even how to make sure that you are not using a mixture that is too weak or too strong. All in all, we know everything there is to know about oils so if you have any questions then please do get in contact with our talented experts today!